Flat rate shipping! Order as much as you want and pay only $7! Wrap yourself in the warm and sweet embrace of our Hint of Vanilla Body Oil. Its delicious aroma of vanilla is exactly what you need for a happy and merry day. It will keep you cozy and relaxed leaving your skin full of glee and delight. A splendid addition to your daily body care routine, it will keep your body smooth and lightly scented through out the day. Our body oils are made with a blend of organic sunflower oil and organic jojoba oil that is readily absorbed leaving the skin feeling soft and silky. All natural. Scented only with natural essential Oils. Amber bottles are made with 100% recyclable PET. 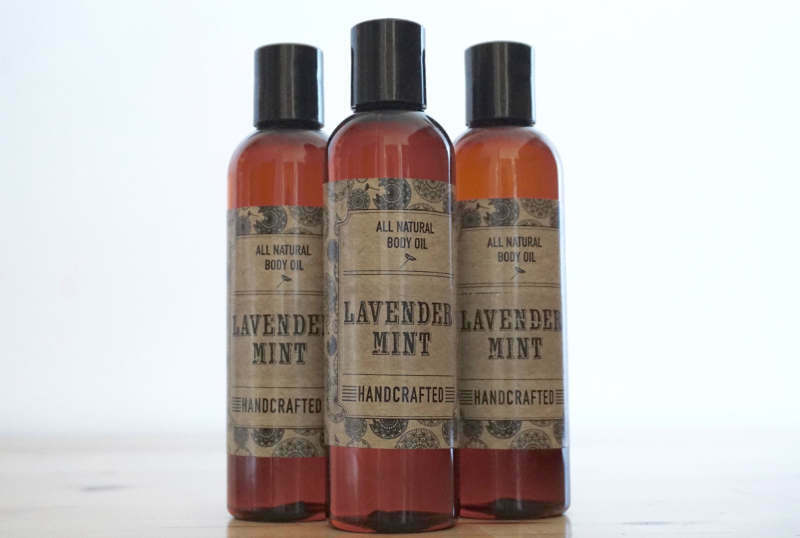 Our Lavender Mint oil has a harmonic blend of floral lavender and tingly peppermint for a calming and refreshing scent. A minty twist to the classic, well loved lavender that relaxes and revitalizes a tired body. 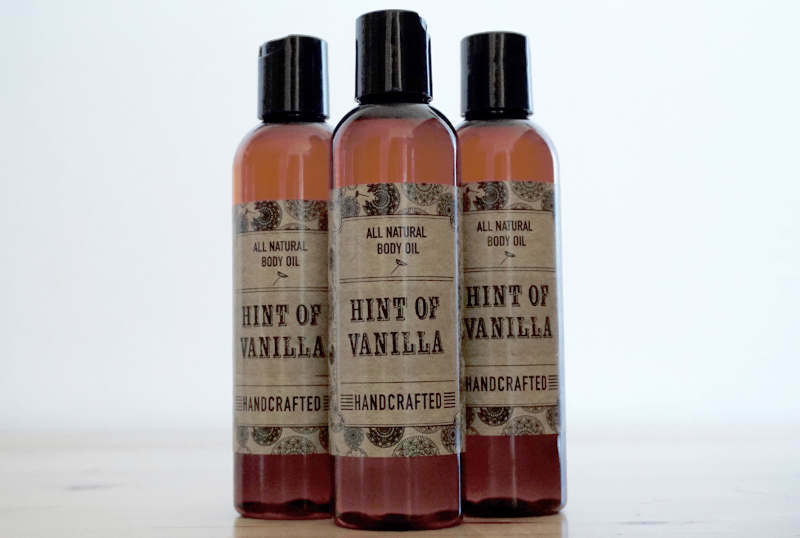 Perfect as a massage oil or an addition to a calming and soothing bath. 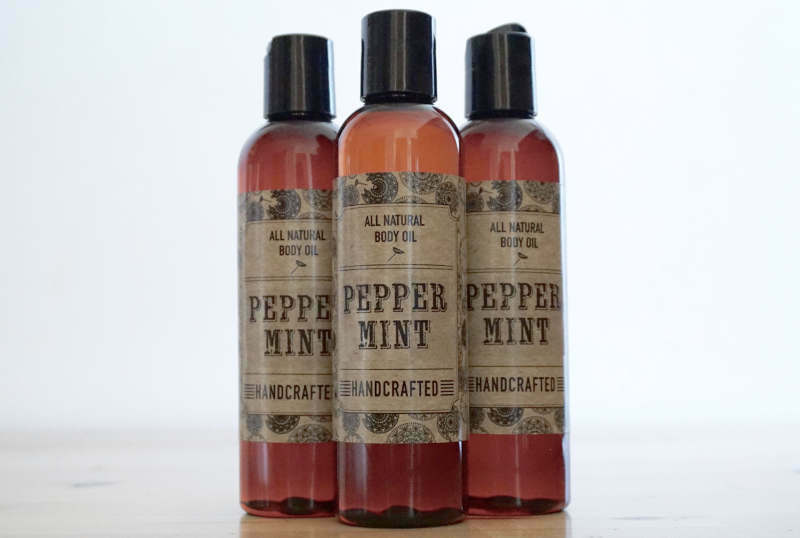 The fresh and invigorating peppermint essential oil leaves your body tingly and cool all over. A perfect mood booster for a hot summer day. We love this as a massage oil or added to a nice hot bath. It is truly vitalizing. 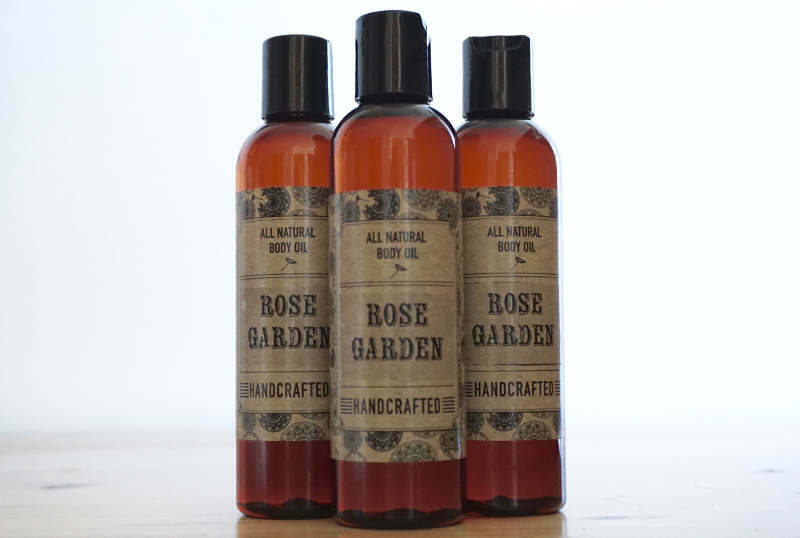 Our Rose Garden Body Oil has a delightful blend of Ho Wood, Lavender, and Amyris for a feminine and sweet scent that transports you into a secret rose garden. It is the perfect body oil for when you want to feel loved and caressed by the beauty of nature that all around us. Perfect as a replacement for a daily body lotion and especially effective after a shower or as an addition to a gentle and soothing bath. 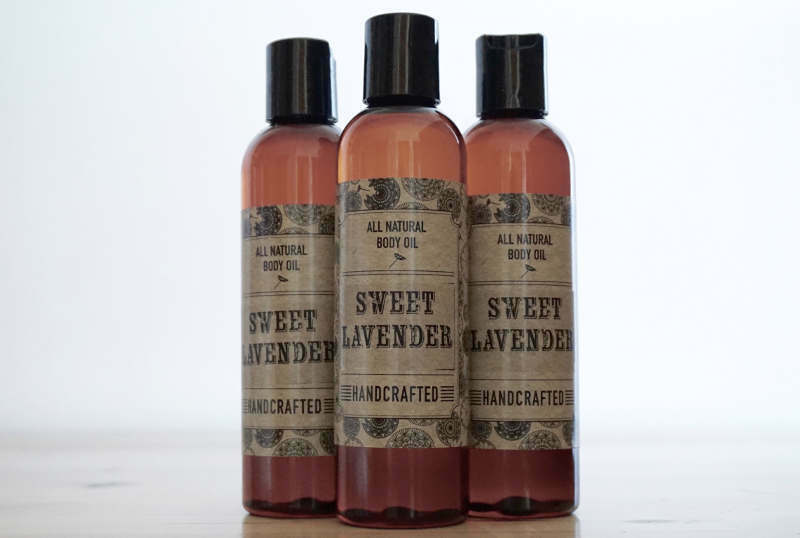 Our Sweet Lavender Body Oil is great for everyday use. Its aroma is light and gentle and very friendly to every skin type. Its relaxing scent takes away the edge of everyday life and keeps your skin happy and soft. A splendid addition to your daily body care routine as it perfectly replaces any body lotion. A few drops added to a hot bath will help you unwind from the constant hectic modern life. 'Tis is the season! 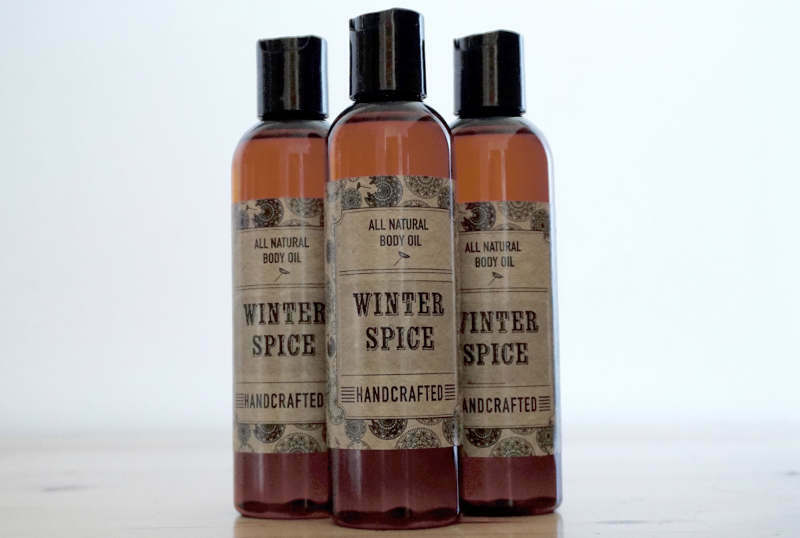 Our Winter Spice Body Oil smells like dreams of Christmas and sweets come true. Its essential oil blend will cuddle you up in sweet memories of past Christmases and the joy and wishes of the ones to come. Even on dark gloomy days it will leave you dwelling in more joyful nooks. A great replacement for any body lotion and a perfect addition to a hot and relaxing bath.